Last night I began hearing chatter of all these people who were getting up early to go see the space shuttle Discovery land at Dulles Airport. Eh? I had no idea what everyone was talking about... that is what I get for not watching the news. Oopsie. I woke up this morning and got all excited reading about the shuttle after pulling it up on our local news website. I asked Kyle if we were allowed to give our kids permission to play hooky from school... to watch a space shuttle land. Hell yeah, we were allowed! We realized that this would be a once in a lifetime experience for us to see... and I'm pretty sure our kids will remember this forever, rather than what they learned in school the morning of April 17th. 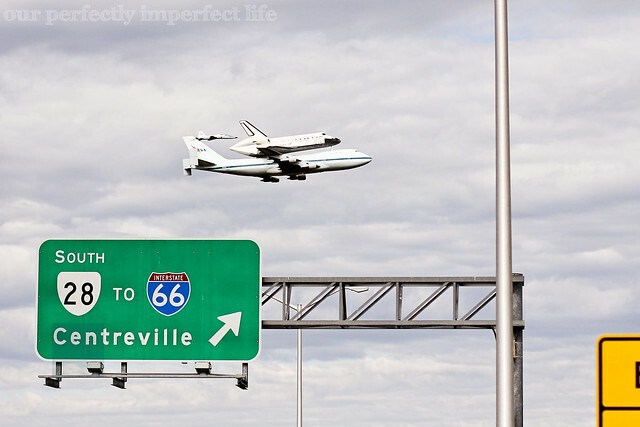 "Get your stuff together... we are going to watch the space shuttle land! I will take you to school when we are done. Let's go!" Traffic was horrific. There were people everywhere. The highway became a parking lot and the police didn't care. That was awesome. We ended up sitting on an overpass right by the end of the runway. "Here it comes! Oh my gosh, this is amazing! Look you guys, there it is!" Cue the floodgates. Oh my word... I bawled as I sat on the hood of my car snapping my camera. That dang fighter jet... does it to me every time. And my sweet son stood next to me rubbing my leg to soothe me... oh, his sweet soul. 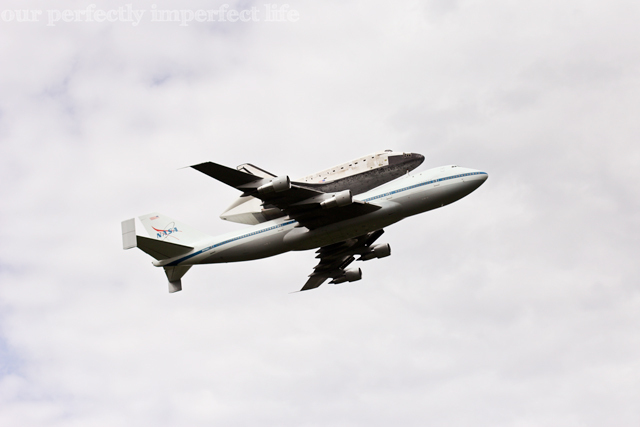 We heard that the shuttle would be circling back around, so we moved down the road to another location. We all gathered on top of the car and waited. This time we were literally right under the shuttle. Seriously a once in a lifetime experience... I was so happy we decided to go. On our way home... we were shocked to see the shuttle again! Apparently it hadn't yet landed, but it seemed it was landing this next time around, as the landing gear was now done. I love our country. I love things like this that bring so many people from all walks of life together. So much pride. So amazing. Love. 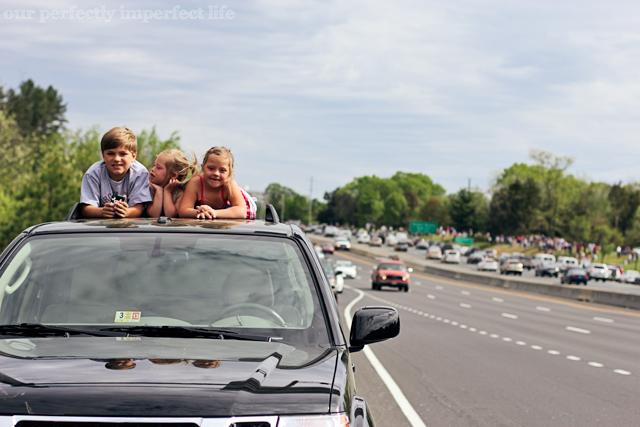 I love the pics, but mostly I love the one watching everyone parked on the side of the road. Brings tears! I can't believe I missed that, I heard it went right over our school and I didn't even know about it till after the fact :( darn. Thanks for the picture though. You got some awesome shots! 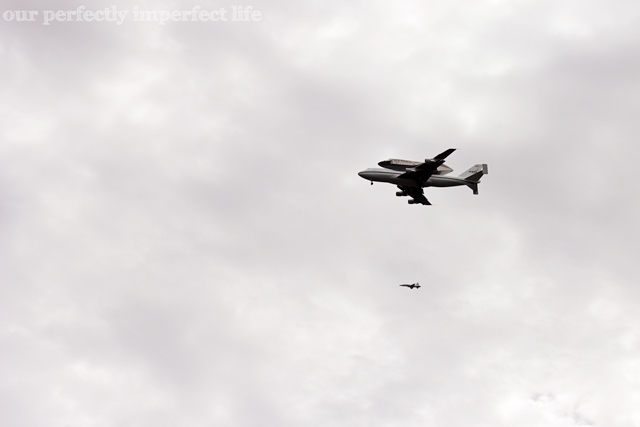 We were stuck on the beltway when it flew right over us -- but all I had was my phone! Very cool experience, wasn't it? That gave me goosebumps. And I learned a new word - amazeballs. It is okay. And it is worth it. It's beyond frustrating... infertility, that is.